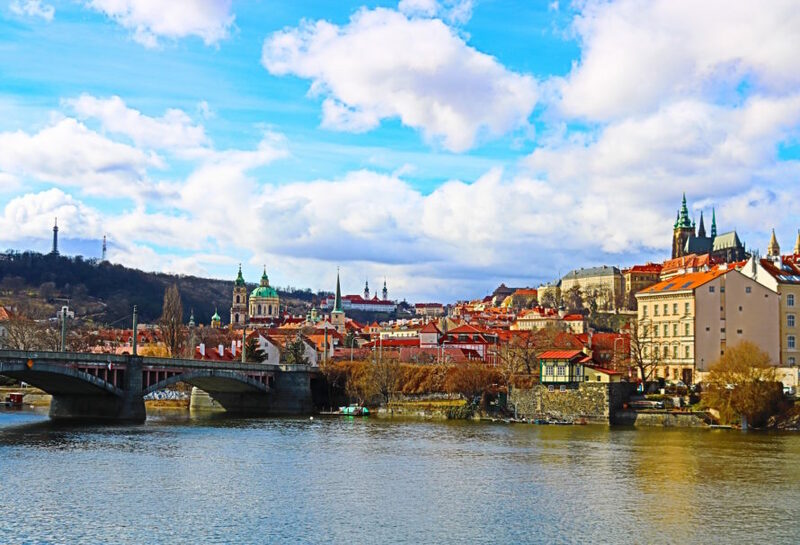 Prague, the capital of the Czech Republic, is one of the few European cities that were spared from destructive bombing raids during World War II. Thus, you will see many now beautifully restored art nouveau buildings. Combined with the city's medieval gems, such as the Charles Bridge and Prague Castle, I could easily see why the Czech capital was chosen as a film location for so many international blockbusters. This central square (Staroměstské náměstí in Czech) is a great starting point for exploring Prague. Next to the St Nicholas Church, you'll find the main tourist information centre, where you can get a free copy of the Prague film locations map "Lights! Camera! Prague!". Most walking tours, such as the Free Tour with Sandemans, also start from here. Always a good idea for a first overview! The free 3h walking tour with Sandeman's covers all the main sights of Prague's historical city centre. If you had a good experience, you can pay your guide a voluntary tip at the end. Get a free map at the tourist information centre or download it online. Only covering films up to 2013, the map is a little outdated, but still fun to walk around with. It also covers some of the many music videos that were shot here. By the way, the most recent films shot on location in Prague include the action‐comedy Bad Spies with Mila Kunis, and the crime TV series McMafia with James Norton. This medieval bridge is among the most famous bridges in the world and usually flocked by tourists. It also happens to be a popular shooting background for action scenes. As such, it appeared in Mission Impossible – Ghost Protocol (2011), Van Helsing (2004) and Blade II (2002). 5. Look out from Prague's "Eiffel Tower"
From the bridge, you can see Prague's "Eiffel Tower". Although smaller than the one in Pairs, the Petřín Lookout Tower is also made of a steel‐framework and thus looks very similar to the real thing. As the Sandemans tour guide told us, the tower was used as a filming location for the trashy American comedy EuroTrip (2004). Being a low budget production, the crew apparently filmed nearly all of backgrounds in the various European countries and cities in Prague. Another famous landmark of Prague is the medieval Prague Castle. To learn about the history, it's best to book a guided tour though as there is not much information on‐site. Among the films that have been shot here are Shanghai Nights (2003), in which the castle stood in for Buckingham Palace, and The Illusionist (2006), in which it pretends to be Crown Prince Leopold's Vienna palace. This medieval square near Prague Castle was used as one of the main shooting locations to recreate 18th century Copenhagen in A Royal Affair (2012). It was also somewhere around here, where pre‐World War II Berlin was recreated for the German war drama Before the Fall (2004). This has nothing to do with film, but it's a very unique thing to do in the beer‐crazy Czech Republic. One place to enjoy this slightly different idea of a wellness experience is the centrally located Spa Beerland. Don't miss the chance for a sneak peak into contemporary Jewish life at the so‐called Old New Synagogue! You can get your ticket (200 Czech koruna) from the visitor centre opposite the main entrance of the synagogue. If you want to dig even deeper into Prague's Jewish history, consider booking the 2,5 h Jewish Quarter tour. Prague's medieval town gate was another hot spot for Mission Impossible – Ghost Protocol (2011). While we stopped here on the walking tour with Sandemans, our guide also told us about the war drama Anthropoid (2016). Shot on location in Prague, the film tells the true story about the assassination of SS General Reinhard Heydrich by two Czech resistance fighters (played by Cillian Murphy and Jamie Dornan). In 1787, the famous Austrian composer Wolfgang Amadeus Mozart conducted the world première of his Don Giovanni at this theatre. Almost two hundred years later, the scene in which Mozart performs Don Giovanni for the Emperor Josepf II in the biopic Amadeus (1984) was filmed here at the original location. This side street linking from the Old Town Square to the Jewish quarter was modeled on Paris. As such, it features many stunning art nouveau houses built in the late 19th century and early 20th century. Today, the street is lined with luxury shops and is considered the most exclusive and expensive street in Prague. Film‐wise, the street appears as a tree‐lined Paris boulevard in Hannibal Rising (2007) and in the romantic comedy The Prince & Me (2004). Not to be missed if you are a fan of art, history and culture, you might want to check out one or more of the city's world‐class museums. These include the National Museum, the City of Prague Museum, the Jewish Museum, The National Gallery, and the Prague City Gallery. Sandemans offers a day trip to this slightly morbid, but fascinating sightseeing attraction located just a one hour drive away from the city. 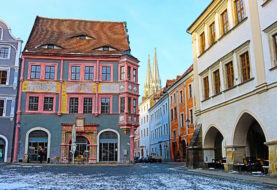 On the trip to the town of Kutná Hora, you will also pass by several other places of historical importance and learn a lot about the country's glorious Bohemian past. Also a one hour drive away from Prague, Terezín was once a magnificent 18th century Austrian fortress. But under Nazi occupation, it was converted into a horrible Gestapo prison, a Jewish ghetto and a deportation camp. On a bus day trip with Sandemans, your guide will bring some of the stories from Prague's sad, but important past back to life. Trdelník: Something you can get only here in the Czech Republic is the typical grilled waffle cone filled with (ice) cream! You can find little booths selling the typical Czech dessert all throughout the city. Crisps on a stick: What I've also seen quite often were crisps‐on‐a‐stick as an alternative to chips / fries. Coffee & cake: The Café Imperial and the Grand Café Orient (also called the cubist café because of it's unusual design) are two grand coffee houses from the art nouveau period. Although a bit more pricey, the charm of old Prague can be best experienced here. The Café Imperial (opened in 1914) also served as a filming location in The Illusionist (2006). Beer: The Czechs love their beers and many visitors to Prague love its bargain prices! Half a litre of a will typically cost you around 50 Czech koruna (about 2 euros). Hostel SKLEP – I booked an affordable single room here, which included a good breakfast in the mornings. It was also within walking distance of Prague's main train station and the city centre. Apartment – Prague is actually quite affordable when compared to other European cities. So if you want more of a local feel, you can stay in your very own Prague apartment – for example at Apartments 39 Wenceslas Square or Old Town Square Apartments (both rated "Fabulous" on booking.com). Disclosure: This blog post includes affiliate links to GetYourGuide.com and Booking.com. If you click on any of these links and make a booking, I will receive a small affiliate fee, which I will use towards running my site.